More New Content by YOU! Nashville Number System Discount Still Available! News: Tons of New Stuff! Alrighty! Things have been pretty busy here at www.music-theory-for-musicians.com. Here are just a few of the things we've been working on. We have a Facebook page now! Go check us out and "Like" our page, share it with your friends, and post on our wall! I can't wait to hear from you. Also you might notice that the all of the pages on our website now have "Like" buttons, so you can "Like" the site or share it with your friends without ever leaving the page. We have a few new article additions from readers like you. A special shout-out is in order to Mike Murphy from Saint Louis for his great tips on learning and memorizing new or hard pieces. Thanks Mike! As for the rest of you guys, go on over and tell us your own tips, we would all love to hear from you. 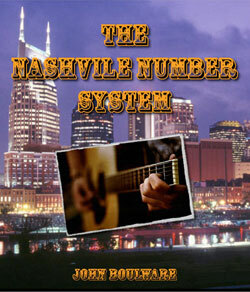 -Nashville Number System Discount Still Available! $6.95! Special Newsletter Price! Not too long ago, I wrote a book detailing how the Nashville Number System works and how YOU can use it in your music everyday. I normally charge $8.95 for this book, but since you are a newsletter subscriber, you get a special discount at $6.95! This deal won't last forever, so go ahead and check it out. You can click the picture above to learn all about it, but remember, YOU HAVE TO USE THE LINK BELOW TO GET THE DISCOUNT! If you have any trouble with this, please just reply to this email and let me know. Most people are familiar with working in either "major" or "minor", but a lot of people don't realize that there are actually 3 different minor scales. They are similar in structure and sound similar, but they have slight (but very important) variations. What makes this a "minor" scale as opposed to major is the fact that the distance from the root note to the third is an interval called a "minor third". A minor third is a fancy way of saying it has one and one half steps, where as a major third has two whole steps. This natural minor scale also has a lower 6th and 7th than a major scale does. If you compare the above C minor scale to a C major scale (C D E F G A B C), you will notice that it has a flat 3, 6, and 7. This is a very convenient way to look at minor scales: by comparing them to their parallel majors. If you compare these two scales to the above natural minor scales, you will see that the 7th note is higher. You could think of this scale as a natural minor with a sharp 7, or as a major scale with a flat 3 and 6. So here's the deal on this one. In the ascending form, the scale is basically half minor, half major. It has the minor third like the other two, but the 6 and 7 are both higher, just like in a major scale. So you could say that it is a natural minor scale with a sharp 6 and 7. Or, you could say that it is a major scale with a flat 3. I prefer the first way because it compares it to the natural minor. You'll see why in just a second. On the descending side of things, let's compare it to the natural minor scale. Oh, wait... it IS a natural minor scale. That's it! That's all there is to it! So on the way up, it is a natural minor scale with a sharp 6 and 7, and on the way down, it is just a regular natural minor scale. See? Not too hard. The reason we have two different forms of this scale is because of the way we use it in songs. Most melodies like to resolve on the root, and that usually works easiest when you have a 6 and 7 that are closer to that root, so we use the higher or "raised" 6 and 7 to help resolve melodies. Hence the name "melodic" minor. -Timeboxing: Only practice certain things for a certain amount of time. If you're doing scales, only do scales for 15 minutes or so, then MOVE ON!! This keeps you from getting bogged down in certain things too long. If you spend too much time on one thing, you're neglecting other things. Keep it balanced. -Mental Quizzes: Think about scales or arpeggios or modes etc. when you are doing everyday activities such as standing in line at the bank, doing dishes, or driving to work. Pick a time when your mind is not doing anything else, and use it to work on your theory knowledge! Quizzing yourself can be fun and challenging. -Progressive Addition Method: Here is Mike's Practice tip that I mentioned earlier in the newsletter. Check it out and try it for yourself, and again, Thanks Mike! Have some of your own practice tips you'd like to share? Go check out the Practice Tips page and write your own. You might get featured in next month's newsletter! Thanks for reading guys, and keep playing! !